There is nothing better than chilling out on the beach with your friends and family during the hot summer. But sometimes those harsh sunlight can be frustrating when relaxing on the beach. At that time beach canopy becomes your best bet. Under the shaded area of the beach canopy, you will feel relaxed and comfortable. That being said, if you look for best beach canopies online, you will be presented with tons of product that all look exactly the same. It becomes tough to choose any one of them especially when all the manufacturers claim their product to be the best compared to any other products. When choosing a beach canopy, there are so many factors you need to consider such as the weight of the product, shaded area, stability, setup time and so on. To save you all this trouble we have reviewed many products in our lab and after rigorous testing, we came up with the list of best beach canopies in 2019. Next, we have ABCCANOPY Pop up Canopy Tent in our list. When installed, this large canopy covers up to the 10 feet of area to provide you as much shade as possible. It is large enough to accommodate 10 people at a time, or you can fit 3 chairs while on the beach or it can cover 4 tables in the garden, so you can guess how massive it is. Thanks to its sliver coated polyester material it will deflect any sunlight, and its water-resistant capability will become handy in rainy seasons. It’s UPF 50+ rated heavy material won’t let any UV rays or harsh sunlight get past the top of the canopy. Although it is heavier (56 pounds) than the other canopies we have on our list, but you can easily transport it using the included wheeled carry bag. The roller bag features sturdy wheels which result in smooth glide when transporting the canopy. Now if we talk about the design of canopy, then it is very well-designed in terms of material and technique used in construction. First of all Centre stable protection system of this canopy directs the rainwater away from the top point preventing the water pooling on the tent. Also, the highly attached Velcro makes this canopy stick on the frame especially when the high wind blows. On top of that, the legs can be adjusted using the 3 height settings, and the deluxe truss washers provide a stable structure when it is installed. Despite its large dimension (120 x 120 x 133 inches) and heavy weight it can easily be installed by two people, and installation procedure is relatively easy and so the dissembling process too. The ABCCANOPY pop-up canopy tent is perfectly suited for outdoor sports, events, festival, play ground or beach. This beach pop up canopy is backed by 1 year of warranty and it comes in 28 different color options so you can have a variety of choices. If you are looking for a canopy that can be easily set up by only one person and that too in just under 5-8 minutes then we recommend the CROWN SHADES instant beach pop-up canopy for you. One of the best features of this tent is the fact that you can turn the canopy on any side by adjusting any two legs lower to the ground. This will prevent the sunrays from getting in thus provides you the optimum shade. The steel frame of the canopy is coated with gray powder which is rust-resistant and prevents the chipping and peeling. And the canopy top is made out of durable 150D polyester material and if that is not enough then the whole material is rated for UPF 50+ UV protection. The 121 square feet of shaded area is more than enough to fit up to the 6 to 8 people. Also, the center height of the tent is 8.69 feet, so it is best suited for tall people too. The assembled size of the tent measures around 11 x 11 x 8.46 inches, and it weighs about 31 pounds which is lighter than other products we have reviewed on our list. You can use this canopy for the exhibition, group or public issues, stall, hotel, club, school, outdoor sports, travel, entertainment, sea beach, camping, or hiking. You will get wheeled storage beg, canopy frame, canopy top, 4 guy ropes, and 8 stakes with the purchase of this product. This pop-up canopy is backed by 1 year of manufacturer’s warranty that will make sure that the product will last longer. If you are in search of beach canopy that is lightweight and at the same time provides the greater shaded area, then you should check out EzyFast 7 x 7 ft. Pop Up Beach Canopy. It weighs around 17 pounds making it one of the lightest canopy in our list. And it provides the 36 square feet of shade area which is quite decent given its affordable price range and lightweight design. With this shaded area, you can comfortably accommodate two adults and two children at once. The compact and sturdy design of this canopy enables you to set it up quickly while the carrying bag makes the transportation of this canopy easy. If we talk about the installation process, then it is relatively easy and requires only 3 steps to complete it. First of all, extend the preassembled steel frame of the canopy and then attach the fabric top with Velcro straps at the corners. Now all you have to do is fully open the canopy and adjust the height according to your need, and you are good to go. Made out of 190T fabric material, the top of the canopy is sunrays/UV rays protected and water resistant as well. The gravity leg fabric does not only look stylish, but it also functions as weighing down the canopy. You will find it very interesting that this specific canopy does not require any ropes or pegs to keep it in place because of strong winds. Instead, it uses the leg pockets located at the bottom of each leg. There are two leg pockets in every leg totaling up 8 legs which either can be used as sandbags to make it more stable during windy conditions or it can be used to store personal belongings. What I like most about this canopy is its full-size back wall. You can roll down this back wall for either sunrays, windblock or have some privacy. This pop up beach canopy is best suited for leisure activities such as camping, finishing, picnic, outdoor sports to use at campground, river side, park, beach, soccer field etc. Coleman has been an excellent manufacturer that produces quality outdoor gears. And this Instant beach Pop-Up canopy by Coleman is no exception. What I like most about this canopy is its blazing fast installation time. You can fully set up this canopy in under 5 minutes in 3 easy steps with the help of two people. If you are worried about the ventilation, then you will really enjoy the built-in two valve at the top to keep the air flowing inside the tent area. The canopy cover is made out of UV guard material which offers the maximum protection against UV sunrays in summer. The whole top of the canopy is constructed with 150D polyester which is quite durable and lasts longer than other materials. The rugged material of this canopy is rated for SPF 50+ UV guard protection which is superior to any other technology. The lightweight preattached telescoping poles can be attached when the canopy is not fully installed, and the comfort grip locks the shelter into place by using the pinch-free adjustability. The pinch-free button here is easily adjustable, and it is very well-designed. Now if you are worried about the high winds falling down your tent then do not worry because this tent features a footed pole with steel tent pegs to easily stabilize it. It offers a total of 169 square feet of the shaded area while the foot print area features about 100 square feet of area which is enough to accommodate 9 to 12 people easily. Also, the Hexagon shape of this canopy offers distinct shelter. The 9 feet and 7 inches of standing height of this canopy will enable the tall users to enjoy the cold shade. When it is time to pack up, then you can easily dismantle it and store it in a wheeled carry bag and transport through the car. Next, we have Sport-Brella canopy umbrella which has a unique design then all other canopies from our list here’s how. First of all, as you see from the image, it is actually an umbrella with a bigger size so it can accommodate more people. 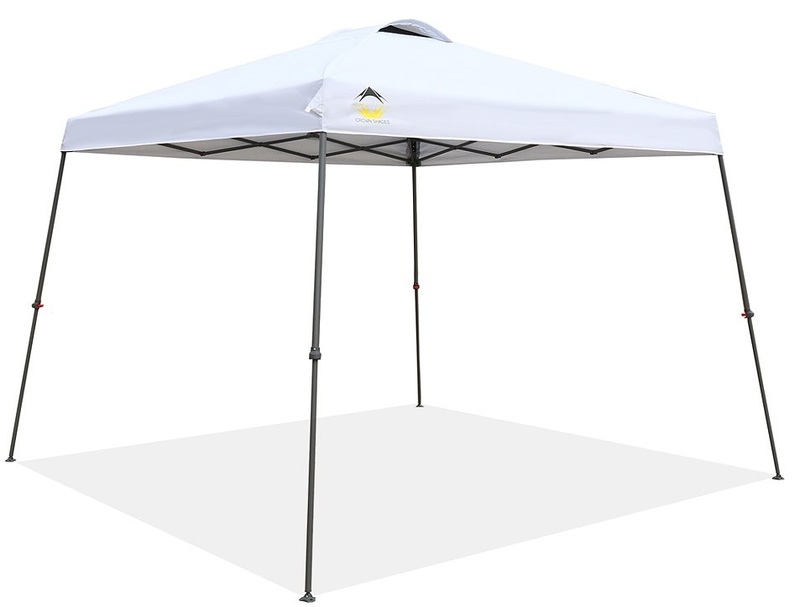 This 8-foot long canopy is made out of 201D polyester which basically protects you from all kind of weather. The whole canopy is supported by 4.5mm steel ribs and a 5 mm steel stretcher. One of the best advantages of this canopy is that you can easily set up. And from the setup I mean all you have to do is just open this umbrella and to hold it down in windy conditions you can attach stakes. The material of this beach canopy is rated for UV rays up to the UPF 50+ which will reflect 99% sunrays and on top of that it is water resistant too. When installed, this canopy will give you a shaded area of 8 feet. And when folded down, it measures as small as 54 x 4 x 4 inches. You will find it very interesting that this canopy weighs just 9 pounds making it one of the lightest canopy in our list. If you need ventilation, then the two side windows will become handy and can be zipped too. While the top wind vents and side flaps add another advantage in the list. If you don’t like this particular color, then you will feel amazed to hear that this product comes in 3 colors to choose from. Also, the included carry bag makes it easy to carry it around without too much hassle. The purchase of this beach canopy includes a carry bag, 8 steel ground stakes and 3 tie-down cords of 8 feet. So if you are in a search for a canopy that can be quickly assembled and doesn’t hurt your budget too then we recommend Sport-Brella Vented canopy. If you are looking for a Pop-up Beach canopy that is easy to install then CORE instant shelter pop-up canopy is for you. In summer the sunburn is the biggest issue most of the people have because their canopy does not block the sunrays and on top of that if the canopy does not deflect the sunrays, then its temperature will increase resulting in uneasiness. Well in case of CORE beach canopy, it blocks 97% of harmful UV rays and deflects the harsh sun rays which will keep the inner area of tent cool. Also, the 10 x 10 inches of tent area will fit in many people at once while the 100 square feet of shaded area will give you the comfort you desire. You will find the setup process of this canopy tent to be very effortless and easy. It takes less than 2 minutes and requires only two people to set it up fully. To install it, first of all, pitch the steel frame then attach the canopy-top to the steel frame and then extend the tent legs. Also, you can quickly setup and adjust between three leg heights using the easy-to-press oversize button located on the leg. Made out of heavy-duty 150D polyester, the material of this canopy is durable and it will last longer than you think. The top joints of the canopy is constructed with fully-taped seams that will repel the all rain water. To top it off, the canopy is water resistant and the top profile of the canopy is pointed upwards which helps in steering away the rain water. When it comes to ventilation, the Core instant canopy is incorporated with the built-in double vents at the roof, and it is certified with the CPAI-84 requirement. The whole package comes with wheeled carry bag for easy travel, ground stakes, tie downs, and steel frame. The Pop-up canopy by Amazon is another great product we have on our list. This canopy is different than other canopies, here’s how. First of all, it does not include a water proof base. It is more of a pop-up canopy designed with the sole purpose of sun protection. This tent is best suited for lightweight conditions because the strong wind or heavy rain will destroy it. But let’s forget it is designed by one of the biggest company and it has so much to offer, let’s have a look. First of all, the 96 square feet of shade and cathedral style roof of this canopy will accommodate significant people at once, and it has made possible because of the angled legs. The steel frame/legs of this canopy are coated with the white powder to help prevent the chipping, rust, corrosion, and peeling of skin. This tent can be used for commercial, recreational use or beach/outdoor activities. Although it does not have side walls but it is designed to provide more of airy feel. The top of the tent will deflect 99% of UV rays, and the pointed profile of the top will direct the water away from the sitting area and prevent the pooling of water. Although the tent is water resistant but it is not advisable to use it for prolonged rain or strong wind. It can be folded down to 5-foot compact luggage which can then be stored in most trucks or car. You may find the 37 pounds of weight of this canopy a bit heavier but the included wheeled bag makes it very easy to transport it. is a website where you can find fair reviews about products like Mouse , Router , Bluetooth Speakers etc.